I feel like I’ve known Pete Seeger since I was 18, even though I never met him. So, when the news came that he passed away this week, memories of his music and social causes that inspired many returned easily. When I graduated from high school, I received a guitar as a graduation present from my parents. Odd, since I had shown no interest in playing the instrument. A few months later at Christmas, my brother gave me “The Incompleat Folksinger,” a book doubling as a songbook and autobiography. In it, Pete laid out his views on social and economic justice, his flirtation with popular music as a member of the Weavers in the early 1950s, and then his targeting as a Communist in the 1950s. All that, he interspersed with lyrics and tablature of many songs. His story, from his work with labor unions during the Depression through the McCarthy era and into the anti-war and civil rights movements of the 1960s, became the subject of a history thesis my senior year of college. My thesis argued that the political left showed continuity, from its heyday of support for the working class in the 1920s and 30s, moving through the anti-Nazi era, then weathering the lean, red-baiting 1950s, only to emerge in the 1960s with new issues of peace abroad and racial justice at home. 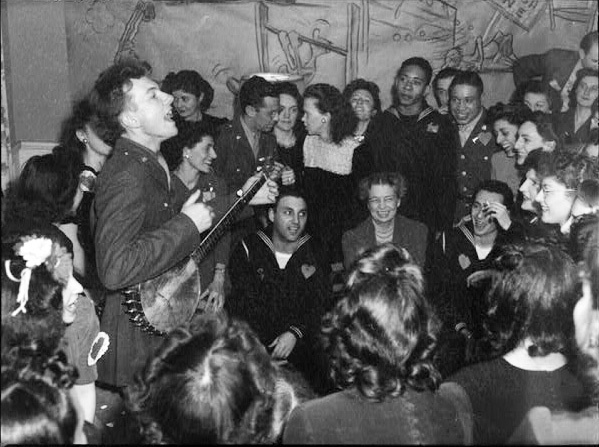 Through it all was music, the folk music of Pete Seeger and others that helped frame the issues, spread the word and unite the activists and supporters. Pete played with Woody Guthrie whose ballads touched a nerve for the mass of unemployed during the Depression; he played with Bob Dylan and Joan Baez, whose folk music in the 1960s addressed the Vietnam War and the Civil Rights movement. Moving into the 1970s and 1980s (and beyond my graduation and focus of thesis,) the fervor of those movements was passing, even though goals connected to those movements had not been attained. Pete Seeger remained, while many in my generation moved on, to work and family, leaving behind those ideals for which we had once so passionately believed in. Pete (as if he were my best friend) stayed true, true to his music and to his ideals, finding the right balance to match his humble lifestyle. He was the thread to the next progressive movement, using his name and his music to advance environmental issues, specifically the cleaning up of the Hudson River. I was not surprised to see Pete Seeger performing at President Obama’s inaugural in 2009. He was on the stage set up in front of the Lincoln Memorial, along with Bruce Springsteen. Springsteen had put out an album a few years earlier entitled The Seeger Sessions, where he adapted Seeger’s Americana songbook to his own band and style. Seeger again became the continuity, for the music and the politics, sharing his concern for the common man and woman, the working class squeezed out by an economy that catered to the wealthy few. Thus, it was not surprising to see Pete join the Occupy Movement. He was 90 then. Much has been written of Pete Seeger’s affiliation with the Communist Party and with the resulting blacklist for ten years which kept him off the airwaves for ten years. Not his music, though, with its clear lyrics advancing causes which now seem mainstream. The blacklist became his badge of honor, one he didn’t thrust forward as a victim but one that kept him steadfast in his own view of the world. His life made it on to the front page of the New York Times, while those who tried to silence him have long been forgotten. His season had come, again and again. The first and only time I saw Pete Seeger in concert was in 1975 when he performed with Brownie McGhee and Sonny Terry at Carnegie Hall. What was most memorable was Pete brought out a log and an axe for one song, and sang by himself, keeping beat with the swings of his axe hitting the wood. We will likely never see that again. My last post was another obituary of sorts. Mandela and Seeger were the same age. And exhibited the same persevering commitment and passion for social justice. This entry was posted on January 30, 2014, 10:38 pm and is filed under Personal memory, Public Affairs, Public History. You can follow any responses to this entry through RSS 2.0. You can leave a response, or trackback from your own site.